If your team already has a LaunchDarkly account, a team member with invite privileges (typically an owner or admin) must send you an email invitation to join the team. Once you receive the invitation, follow the sign up instructions and you will be automatically added to your team’s account. You should now be able to accept the invitation from your team owner using your preferred email. If you're unable to delete your account, you also have the option of editing your email address from the profile tab of your account settings. You can configure your identity provider to send `role` and `customRole` attributes when the team member is signing into LaunchDarkly. `role` is an optional attribute, which represents a built-in LaunchDarkly role. It must be one of reader, writer, admin. If unspecified, the default role is reader. `customRole` is another optional attribute. It must be a list of keys for custom roles to give to the team member. These will replace the member’s existing custom roles. If a member has any custom roles, they will supersede the built-in role. When a team member tries to log in to a LaunchDarkly account which has SSO enabled, they should be redirected to login via your Identity Provider. If a team member is prompted for a password, this indicates that an account has not yet been provisioned for that team member. LaunchDarkly does not support automatic provisioning of new team member accounts. To add new team members, the initial login must be done via a LaunchDarkly application set up in your Identity Provider. Once that step has been taken, the account will be created. On subsequent logins, the team member will be redirected to your IdP when attempting to log in via the LaunchDarkly website. Read more about user provisioning in our documentation here. What happens if I have multiple custom roles with conflicting policies? If a team member has multiple custom roles, we iterate through each role and see if it will approve the action. If so, the action is approved immediately. If the role denies a certain action, we continue to iterate through the remaining roles to see if any of those roles approve that action. In short, if a user has a custom role that allows an action that another custom role denies, the action will ultimately be allowed. If MFA is enabled and you are locked out of your LaunchDarkly account, you can contact the LaunchDarkly owner or one of the admins at your company to get a reset code. Once you receive this reset code, you will need to head to your profile settings page and re-enable MFA using an authenticator app on your phone. Are you the account owner? Unfortunately, no one at your organization has sufficient permissions to reset your MFA. Reach out to support@launchdarkly.com and we'd be happy to assist you in regaining access to your account. Check out our Getting Started Checklist to get the most out of LaunchDarkly and check out our getting started docs. After you create a LaunchDarkly account, you will have access to our Quickstart tutorial. The Quickstart will walk you through the creation of your first feature flag using any of our SDKs. We also have sample applications for all supported SDKs. These are simple applications designed to show how the SDK works. You can find them on Github here. LaunchDarkly is a continuous delivery and feature flag management platform built for teams. The platform allows companies to continuously deliver and deploy software to their users in a faster, more reliable way. You wrap your features in LaunchDarkly flags, which allows you to have full control over who sees the feature (users or user groups). It helps companies perform gradual feature rollouts, disable buggy features without redeploying, and reduce development costs with a more streamlined development cycle. Feature flags are a software development best practice of gating functionality. Functionality can be deployed “off”, then turned on via the feature flag, separate from deployment. With feature flags, you can manage the entire lifecycle of a feature. LaunchDarkly revolutionizes software development by allowing you to iterate quickly and safely. We allow you to easily flag your features, which enables you to manage them from the LaunchDarkly dashboard. Roll out a new feature to a subset of your users (like a group of users who opt-in to a beta tester group), gathering feedback and bug reports from real-world use cases. Gradually roll out a feature to an increasing percentage of users, and track the effect that the feature has on key metrics (for instance, how likely is a user to complete a purchase if they have feature A versus feature B?). Turn off a feature that you realize is causing performance problems in production, without needing to re-deploy, or even restart the application with a changed configuration file. Grant access to certain features based on user attributes, like payment plan (eg: users on the ‘gold’ plan get access to more features than users in the ‘silver’ plan). Disable parts of your application to facilitate maintenance, without taking everything offline. Is it easy to set up and integrate? Yes! We’ve made LaunchDarkly extremely developer-friendly and easy to integrate. You and your team can start controlling your first feature in minutes. We also provide excellent customer support to help you get started. Our unique streaming architecture ensures that feature flags are updated instantly, without introducing any latency to your site. LaunchDarkly's performance is even faster than storing feature flags in your own database. We also have multiple layers of redundancy. All flags are served locally and are backed up by multiple zones of AWS and our globally distributed CDN provider. With the architecture, a feature flag will always be available. How do I schedule a demo or get more info? Complete this form to schedule a free demo and we will be happy to demonstrate the platform and answer all your questions. Our feature flag platform is built to support both small and large development teams with enterprise-grade speed and reliability. How do you calculate monthly active users? We calculate the number of unique users across all environments over your billing cycle. Anonymous users are tracked by session, so a single user who visits multiple times will only be counted once. Which order are flag targeting rules evaluated? Our targeting rules evaluate from top to bottom and take the first match. The first matching rule will take precedence over any of the rules that follow. Learn more about this in our documentation here. What can I do with feature flags? Feature flags (or feature toggles) are meant to complement features branching and distributed version control systems. One of the primary benefits of features flags is the ability to separate feature lifecycle management from code deployment. LaunchDarkly provides an intuitive dashboard that lets developers wrap features or application behavior in our feature flags. You can then manage your features on the LaunchDarkly dashboard, roll out to users, and see how well things are performing. Non-technical users can observe feature performance and analytics, perform A/B testing, set and manage goals, and have full visibility into feature performance. LaunchDarkly lets developers wrap features or application behavior in our feature flags. You can then manage your features on the LaunchDarkly dashboard, roll out to users, and see how well things are performing. LaunchDarkly gives you total control of your application. Turn features on and off for your users without waiting for engineering. Roll out to percentages of your population, segments, or whatever rules you define. Get faster feedback from the people you want. Measure the impact of your features with our NewRelic and Optimizely integrations. What are boolean and multivariate feature flags? LaunchDarkly supports both boolean and multivariate feature flags. A boolean flag has two variations true and false, which works best for feature flags that will simply turn things on and off. A multivariate flag allows you to define two or more custom variations. These variations can be strings, numbers, JSON objects, or JSON arrays. Check out the docs. Okta, OneLogin, and Azure all support an official LaunchDarkly application. See our documentation for complete setup instructions as well as configuration tips for specific providers. LaunchDarkly targeting lets you turn features on or off for individual users or groups of users. You can use the Targeting tab to roll features out for internal testing, private betas, or usability tests before performing a broader rollout. You can create your own rules to target who you want, when you want. Learn more about targeting users in our documentation here. LaunchDarkly provides you with a centralized dashboard to manage the lifecycle of your features from local development, to QA, to production. Manage multiple different software projects with their own development environments. Projects allow you to manage multiple different software projects under one LaunchDarkly account. For example, you can create one project called Mobile App and another project called Web App. Each project will have its own unique set of environments and feature flags. By default, all team members in your LaunchDarkly account will have access to every project within that account. Environments allow you to manage your feature flags throughout your entire development lifecycle — from local development to QA, staging, and production. When you first sign up, you're provided with two environments within a project. By default, they're named Test and Production. Each environment has its own private SDK key, which is used to connect a LaunchDarkly SDK to a specific environment. Each feature flag that you create has its own unique set of targeting rules for each environment. This means that you can change your flag rollout rules in a development or staging environment for QA testing before rolling out to production. The debugger helps you test whether you've set up LaunchDarkly correctly. From the debugger, you can see your users' feature flag requests and events in real-time. You can access the debugger from the sidebar. The debugger must be the active tab in its browser window in order for events to appear. You can have a second window open with your application, if you need to click around in your app in order to generate events. Please note that in high-volume environments, the events sent to the debugger may be sampled. When this happens, you will see a subset of events on the debugger, instead of every event. The debugger is helpful for troubleshooting that you're successfully sending events to LaunchDarkly and is not intended as a source of truth for the variations your users are receiving. The debugger displays real-time events only and does not keep a historical record of this data. Read more about the debugger in our documentation. Anonymous users work just like regular users, except these users are not stored in your dashboard. One of the primary reasons that users are sent anonymously is to avoid having a lot of unauthenticated users polluting the user dashboard. Another reason is to avoid sending PII, but we recommend the use of private user attributes if that is the case. There are some cases where you do need to generate a unique key for anonymous users. If you are targeting users individually by key, using LaunchDarkly's A/B testing feature, or the Analytics Data Stream you would want unique keys. You also want unique keys when conducting percentage rollouts. For that reason, the general documented advice is to treat the anonymous users like regular users and assign unique IDs. If you do not have a need to uniquely identify your anonymous users, you could use a shared key for these users. How are A/B Test Results Calculated? When a conversion event comes in, we try to find the 'closest' feature event. To do this, we look for the latest feature event for this user in the 24 hours preceding the conversion event. (Failing that, we will look for the earliest feature event for that user in the 5 minutes following the conversion event, to allow for clock skew). Once we find a feature event, we look at which variation that user saw, and we add the user to the set of users who saw that variation and converted. As long as there is less than 24 hours between t2 and t1, user X will be added to the variation B conversion set (and *not* the variation A conversion set). In this same timeline, but when there is more than 24 hours between t2 and t1, we will not find a feature event, so the conversion will not count at all. If there is less than 24 hours between t1 and t0 AND less than 24 hours between t3 and t2, then user Y will be counted in both the variation A conversion set *and* the variation B conversion set. If there is less than 24 hours between t1 and t0 AND less than 24 hours between t3 and t2, then user Z will be counted *once* in the variation A conversion set. Keep in mind that the important time limit here is 24 hours. If someone converts 5 days (or 2 days) after (or 2 days) getting a variation, they will not be counted. Contact us at support@launchdarkly.com if you have any additional questions. Once you’ve rolled out the feature to a group, measure it to see if the feature has impacted behavior as you expected and use that feedback to inform your path. Fix issues and make changes as necessary then continue to rollout incrementally to the entire base. LaunchDarkly allows teams to develop software in a way that’s fundamentally healthier, removing friction from the Product and Engineering relationship. The results are a dramatic savings in time and focus as well as faster delivery with greater trust. Empowered product development means that both technical and non-technical team members can collaborate on software releases. Because feature rollout will be decoupled from code deployment, team members outside of Engineering would be able to control the visibility of particular features without compromising the app’s integrity. Product and QA teams are empowered to make changes to feature visibility without consuming engineering resources. LaunchDarkly offers end to end feature flag management to allow an entire product development organization to control who gets the right feature, when. The SDK relies on its stored state to evaluates flags. By default the SDK first initializes with an empty state. When the SDK first initializes, it opens a streaming connection to LaunchDarkly. The initial response from LaunchDarkly contains the SDKs current state. The SDK will then keep this streaming connection open and when any change is made in the LaunchDarkly dashboard or via the Rest API, LaunchDarkly will send these changes to all currently connected SDKs. If the SDK ever loses connectivity to LaunchDarkly then it will continue attempting to establish a streaming connection until it succeeds. If you try to evaluate a flag before the SDK receives its initial state, or you try to fetch a flag which otherwise doesn't exist, then the SDK will return the fallback value. All SDKs provide synchronous (through blocking and/or polling) and asynchronous ways of waiting for the SDKs state to initialize. What happens if LaunchDarkly goes down? Outages happen, but LaunchDarkly uses a CDN to continue serving your feature flags uninterrupted in case something goes wrong with our backend servers. Even if the CDN goes down (we use Fastly, a widely-used CDN provider), your servers will continue operating with the last set of feature flag rules, so your customers will continue seeing the right set of features. LaunchDarkly uses a novel streaming architecture to serve feature flags without making remote requests. We use server-sent events (SSE), a protocol for one-way real-time messaging, to send messages to your servers whenever you change the feature flag rules on your dashboard. SSE is widely used for server-to-browser messaging, but it works equally well for server-to-server communication. The SSE connection is all handled under the hood by our SDKs. Our unique streaming architecture ensures that feature flags are updated nearly instantaneously, without introducing any latency to your site. LaunchDarkly’s performance is even faster than storing feature flags in your own database. We also have multiple layers of redundancy to ensure your users always receive a flag. Do I need to modify my firewall to use LaunchDarkly? In most cases no— our streaming connection only requires that your server be able to make an outbound HTTPS connection to *.launchdarkly.com. What’s the overhead of a feature flag request? Almost nothing. LaunchDarkly’s SDKs use a streaming connection to asynchronously receive updates to your feature flag rules. Your actual feature flag requests are served from memory (or a Redis store, if you configure one). This adds less than 1 millisecond of latency to your page loads— about as fast as looking up a value in a hash table. The variation a user receives is determined based on the users key. When a percentage rollout is evaluated it generates a hash from the user's key, the user's secondary attribute if available, and a hidden salt attribute stored in the flag. The SDK then uses this hash to generate a percentage which is used in conjunction with the percentage rollout configuration to determine the variation a user receives. Are anonymous users tracked when A/B testing? Yes, anonymous users are included in A/B testing. You will need to set an appropriate user key for anonymous users so that we can track each anonymous user separately; a session key might be appropriate. We don't display anonymous users on the Users screen because anonymous users couldn't be managed from LaunchDarkly, so they would only add clutter to the screen. We do not impose a hard cap on MAUs. We'll never halt access or send you a bill based on overages. We allow for variance as we know a company's user base can grow unexpectedly over time. That said, we do limit the amount of users that will be saved in your dashboard. When you exceed your MAU, your new users and changes to existing users (such as new attributes) will no longer appear in the dashboard. It's important to note that your users will continue to evaluate their flags correctly. This only impacts your ability to view user updates in the dashboard. All of our SDKs are built on top of the LaunchDarkly REST API. In fact, the entire LaunchDarkly web site is driven via the same API, so it’s heavily tested and complete. If you want to build a custom integration or export your data this API reference is the place to start. You don’t have to send users to LaunchDarkly in advance – just set up your users in variation calls and you’re all set: http://docs.launchdarkly.com/docs/getting-started . If we do not receive a request for a user in 30 days, then that user will expire from the dashboard. Users can be deleted one at a time by clicking the "delete" button to the right of the user in your user dashboard. LaunchDarkly does not keep a record of deleted or expired users. A previously expired or deleted user can be restored only by calling variation or identify on the user with the SDK. If we detect that the user is active again, then they will reappear in the dashboard with the latest set of attributes. Use the drop down menu to select the variation you'd like your user to receive for one or more feature flags. 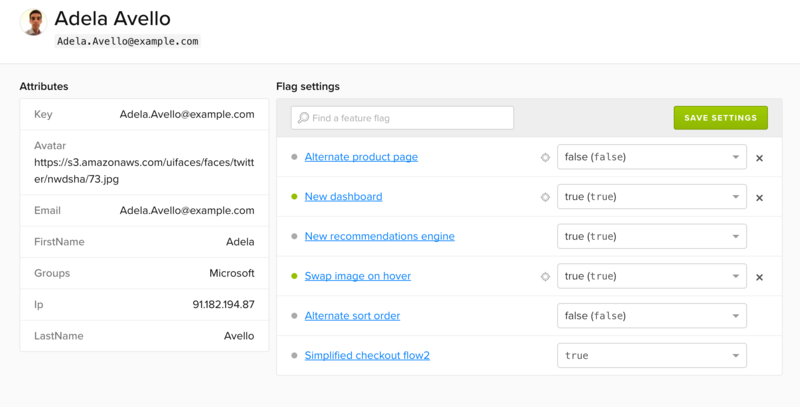 Note that users can also be added to a flag's individual targeting rule from the flag's targeting tab. Learn more about managing your users in our documentation here. What is the default rule? The default rule is a final rollout rule for any users that are not individually targeted and do not match any of your configured targeting rules. As with other rules, you can choose to serve a specific variation, or apply a percentage rollout to any remaining users. For a straightforward percentage rollouts, you can simply use the default rule for a feature flag. For example, to roll out the true variation to 50% of your users, set the default rollout rule to true 50% and false 50%. Why should I avoid individually targeting too many users? Individually targeting users increases the size of the payload fetched by the SDK when initializing, and the memory footprint of the SDK. A better strategy would be to assign a custom attribute to the users who should receive the feature flag and then set up the targeting rules to serve the flag to users who have that attribute. This allows you to target groups of users without increasing the size of the payload. Read more about our targeting rules. How can I be notified of interruptions to the LaunchDarkly service? You may see an error indicating your MFA code is invalid. This error is caused when the 6 digit code generated by your authenticator app has expired or is tied to the wrong QR code. 1. Delete all existing LaunchDarkly QR codes in your authenticator app. 2. Follow the invitation link from your email and scan the QR code displayed. 3. Immediately enter the 6 digit code generated from your application without refreshing. If you're still experiencing any issues, please contact support@launchdarkly.com. It generally takes just a couple of minutes for a user to appear in the dashboard. You can check the debugger to verify that the users data is being sent to LaunchDarkly. If you open the debugger in an active tab and call variations on your users, you will see them appear in the debugger almost immediately. This is a great option to make sure that LaunchDarkly is receiving your user data without waiting for users to appear in the dashboard. You can read more about the debugger in our documentation here. If the Origin header does not match what's expected, we return an error. And since our application relies heavily on interaction with the API, the application will not function properly. Any browser extension that intentionally changes the Origin header will cause this problem. For example, the Allow-Control-Allow-Origin: * Chrome extension is known to change the Origin header to http://evil.com and will result in the problems described above. What does "Your configuration is incomplete" mean? If you're seeing the "Your configuration is incomplete" message, it will usually indicate that there is an incomplete or invalid rule configured for your flag. For example, this could mean that an attribute was not selected, or a negative number was selected for a percentage rollout. Everything works as expected when you target users individually, and users appear to be receiving the correct variation based on the default rule. So why aren't your rules targeting users by attribute working as expected? The SDK will only evaluate flags using the user object you provide it. The SDK does not use the attributes shown on the dashboard, and user attributes are not synchronized across SDK instances. The only information that is synchronized is flag configuration related data. You will need to provide all applicable user attributes for your configured targeting rules to apply. Rest assured that this does not impact your user evaluations - your users will continue to receive the correct variation for the requested flags. This only impacts the ability to send information back to LaunchDarkly. Does the LD SDK support using Postgres to cache feature flag configurations? How do the mobile SDKs handle airplane/flight mode? When a user is in flight or airplane mode on their mobile device, LaunchDarkly will use the latest stored flag settings. When the user reconnects to a network, LaunchDarkly will reconnect to the stream to see if there are any new flag updates. This ensures that your users will always receive the most up-to-date flag settings, even if their devices are not currently connected to a network. The server SDK keys are intended to be embedded in trusted environments. The mobile SDK keys are suitable for use in (untrusted) mobile clients. If a mobile user were to somehow decompile your app, or gain access to your mobile key, there is really no impact, as those keys can only access a restricted subset of our APIs that do not reveal any private data.